An Insulspan home will step into the “lime”-light on a new Discovery channel program. “Green Homes,” which highlights environmentally friendly building products, soon debuts. The program chose this Home Energy Inc. project, (or Martin house), over 50 other green building projects. This is because of its comprehensive approach to energy efficient building. “50 or more houses were reviewed, and ours was ﬁnally selected. It is because of our approach to building solutions that our houses as energy efficient as possible,” says Home Energy Inc. Director of Operations, Brad Scheel. Just what is a comprehensive approach to energy efficient building? First, the Martin house was constructed with Insulspan® structural insulated panels (SIPs) for the building envelope. Next, a geothermal heat pump for heating and cooling and a solar water heater for domestic hot water replace more traditional energy sources. Finally, it included radiant ﬂooring for further comfort and reduced heat loss. Tina Goven, a “green architect” who specializes in designing energy efficient homes, designed the Martin house. The Insulspan SIP System was used for the wall and roof assemblies, and the panels were precision cut. Consequently, both the walls and roof in the ﬁnished structure will be airtight. With an Insulspan home you can greatly reduce energy consumption, leading to reduced greenhouse gas emissions and a healthier home and planet. “The real value is that we can convert any house to an energy efficient SIPS home,” explains Scheel. Interested in this energy efficient building system? 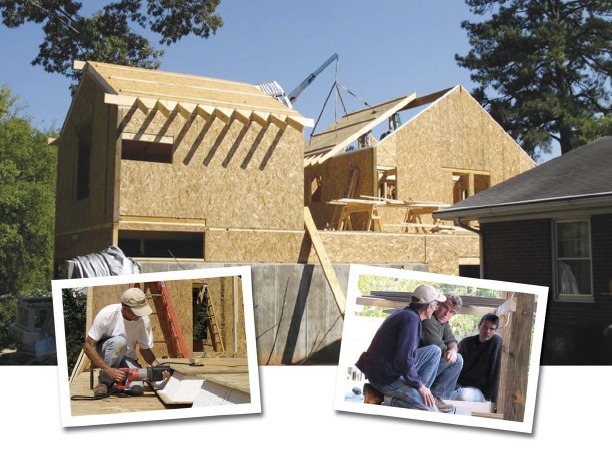 Contact Insulspan today for more information.